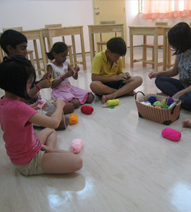 We are a Rudolf Steiner inspired kindergarten in Penang, Malaysia, a small warm island in a great big world. Kung Wai (my husband) and I started Nania as a home based kindergarten in January 1997. We expanded and moved to our present location in 2002. I name it from the “Narnia” stories by C.S Lewis. Like ‘Narnia’, I want it to be a place where children would visit, grow and return again and again. 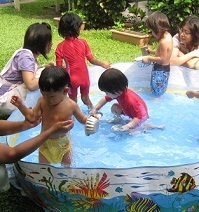 During the days at Nania, the children learn, play together and made good friends. Friendship has also grown between families, mothers, staff and I.
I am so fortunate to have met and continue to meet so many wonderful children and families through Nania. This website is a collection of thoughts, record of time spent, picture memories and information about life at Nania. With it, I hope to keep in touch with all who have been here and those I am yet to meet. 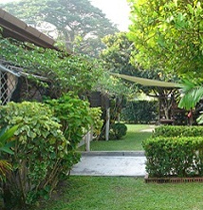 We are a Steiner inspired kindergarten in Penang, Malaysia.